Two of Nvidia's most powerful GPU's on one card. What could be better that that? A powerful GPU, but has too much been cut to fit two GPUs on a single PCB? So here it is, the pinnacle of Nvidia engineering and the fastest single-PCB graphics card the Santa Clara company has ever produced. It's quite spectacular – we're talking about one board with two of the most powerful GPUs Nvidia's ever made jammed on it. Obviously, compromises have had to be made with the chips to get them to run happily on a single card, and to stay within the 375W limit that comes from a pair of 8-pin PCI-e connectors and the motherboard PCI-e bus. That means we don't quite have a pair of the GPUs ripped straight out of Nvidia's flagship single-GPU card, the GTX 580. Instead of the core clock of (a rather bizarre) 772MHz and a shader clock of 1,544MHz, the GTX 590 houses a pair of chips running at a seriously clocked-down 607MHz core clock and 1,215MHz shader clock. The memory clock has also been dropped, from 2,004MHz to 1,707MHz. 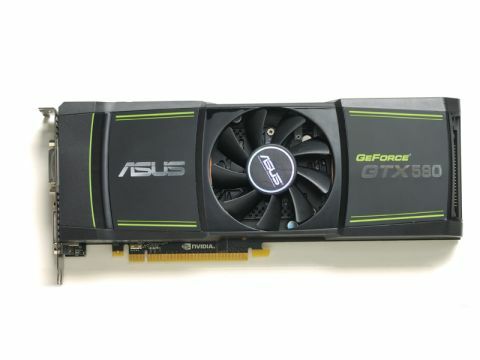 So if you harboured hopes of the GTX 590 acting like a pair of GTX 580s, we're afraid to say that Nvidia has dashed them. The GTX 590 lags well behind an SLI setup of GTX 580s. Luckily, though, Nvidia recognises this, and the card is much cheaper than the top SLI pairing – by almost £200. That's a fair trade-off considering the impressive performance of this dual-GPU monster. At our 30-inch native resolution of 2,560 x 1,600, it topped 30fps in Heaven 2.5, something the dual- GPU HD 6990 didn't quite manage. The GTX 590 is the fastest graphics card known to man, then? Well, this has been a contentious issue between Nvidia and AMD, with both claiming to rule the roost with their latest dual-GPU cards. Unfortunately, in our test suite, neither laid claim to that boast. Both cards took the lead in different benchmarks, with neither of them coming out on top. That didn't change when we added second cards. It showed exactly why going past two GPUs gives you a very slight return. It also served to highlight the inherent driver problems with choosing a quad-GPU setup. The issue is that, while games have caught up in terms of the multi-GPU stakes recently, they only really cover a dual-GPU setup. When you go above that (and, admittedly, few people ever do), you start to introduce a whole host of errors to the proceedings. In the few benchmarks where the quad-GPU worked, we got little extra performance for our outlay. At £1,140 for a pair, we'd hoped for more. Performance in a couple of benchmarks even dropped with the second card, and that was all down to driver and game engine issues. So while the GTX 590 is undoubtedly lightning fast, it's not the quickest card. A pair of 580s is the only way to go if you want untouchable performance at vaguely affordable prices.